It started at noon Tuesday with a toccata (Bach’s) and ended with one (Widor’s) 24 hours later. 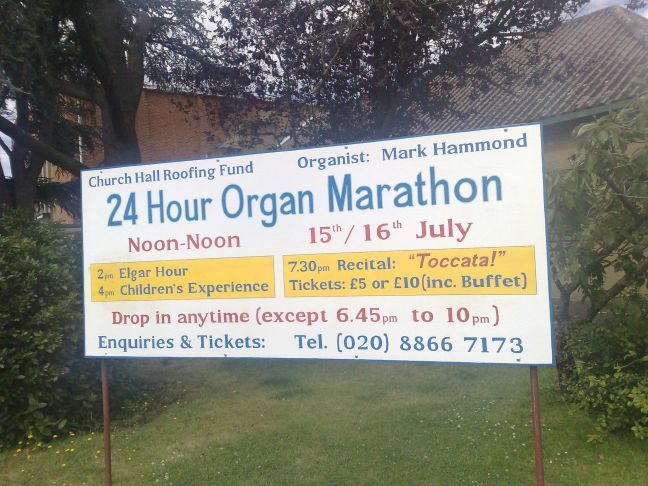 That famous inverted mordent launched the St Edmund’s Sponsored Organ Marathon in aid of the Church Hall Roof. I generally took a fifteen minute break at a quarter to each hour and with longer breaks either side of my evening recital it worked out at between seventeen and eighteen hours of actual playing. A respectable group of around a dozen were assembled as I started. The first two hours were devoted to Bach’s toccatas, preludes and fugues. I didn’t cover all of the pieces in my playlist; as well as the D minor, I included the Toccata, Adagio & Fugue, the eight short Preludes & Fugues (yes, I know that Bach probably didn’t actually write these! ), the Fantasia in G Major and the “St Anne” Fugue. Hour 3 was devoted to Elgar. This started with the Prelude and Part 1 finale to “Gerontius” (a specific request – the finale is quite tricky to play as an organ piece from the vocal score) and ended with the first movement of the Sonata via the usual suspects (Chansons, “Nimrod”, “Salut” and the Adagio from the Cello Concerto). Sibelius’ “Finlandia” launched Hour 4 (Music from Scandinavia) and included music from “Peer Gynt” and chorale preludes and preludes & fugues by Buxtehude. 4pm was the Children’s Experience. 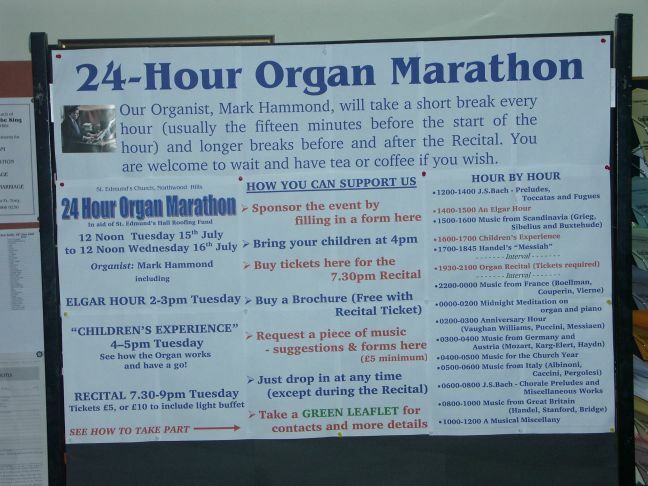 I had no idea how many would come and their ages but in the end around fifteen were given a demonstration on how the organ works and they had a go. 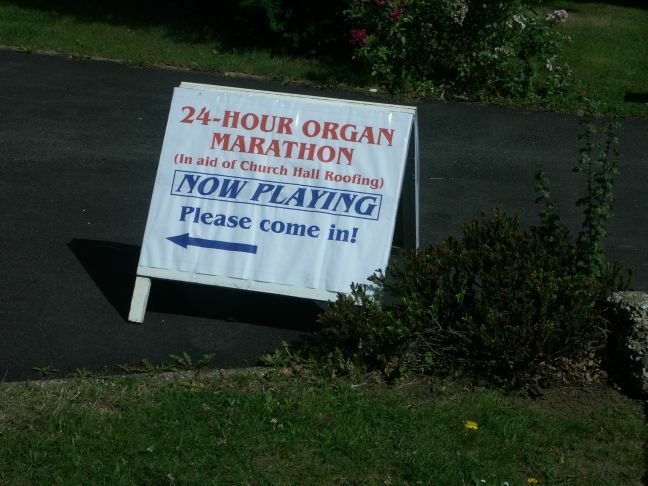 I then played their requests, including “Teddy Bears Picnic”, James Bond and the “Doctor Who” theme! This was then followed by a picnic outside. In the end I was really pleased with the outcome. 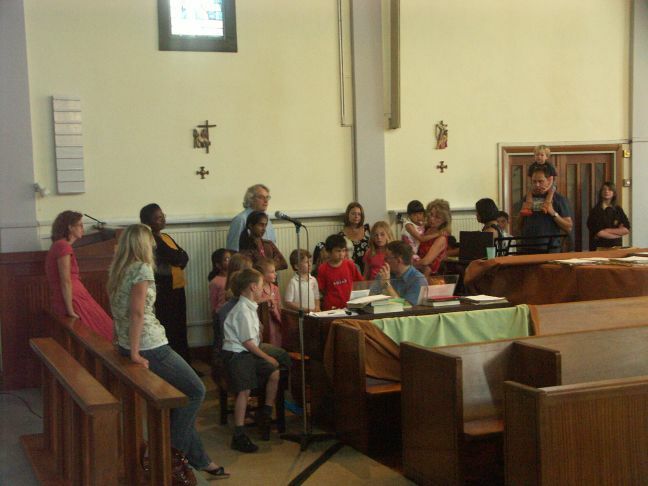 The children were generally well-behaved and took an interest in the demonstration. 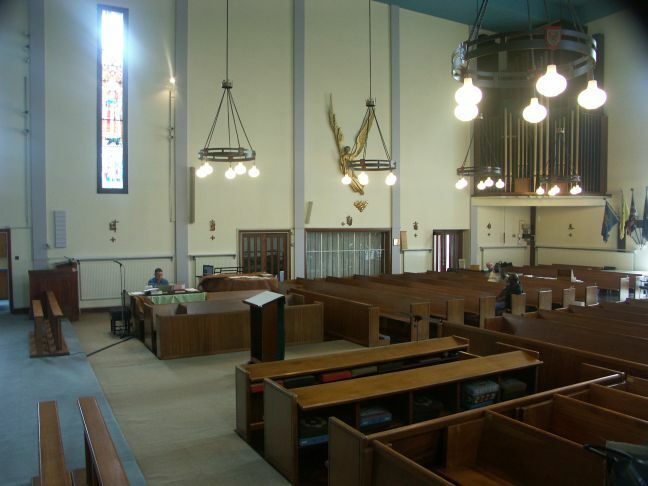 The two hours between 5pm and 6pm were devoted to extracts from Handel’s Messiah and I also had a number of requests to play, the most unusual being “Z Cars” for an Everton Football Club supporter. “Z Cars” was a 60s British television drama which used the traditional Liverpool folk song “Johnny Todd” for its theme tune. Everton Football Club (based in Liverpool) plays this tune as the players run on to the pitch at the start of each match so the piece is very close to this particular Evertonian. Numbers had thinned to around six as some had gone home to get ready to come back for my recital. 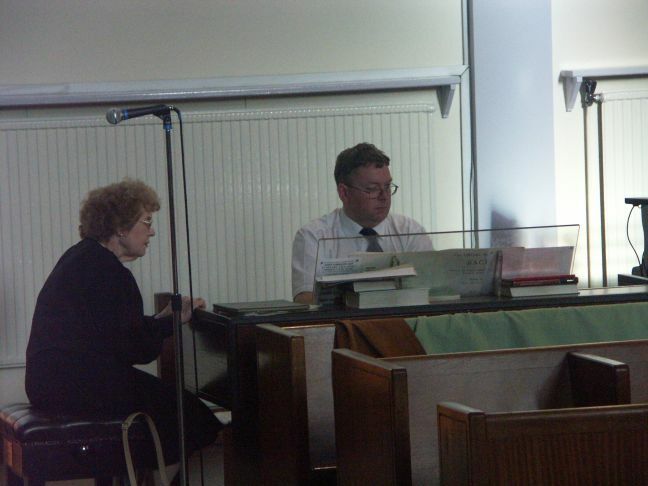 An audience of around seventy were there for my recital. The principal work was Widor’s Fifth Symphony. I had only ever played the final two movements so my challenge for the Marathon was to learn the first three movements. The first movement in particular has some rather awkward moments. The other major works were the Bach D Minor again and Frank’s 3rd Choral with fillers by Elgar (the two Chansons again), Barber (Adagio) and Gigout (Toccata). All was going well until I got to the start of the Widor and disaster nearly struck. The general piston channel selector switch broke and I was unable to select the correct channel. Fortunately the day was saved with a pair of pliers! Around half the audience stayed afterwards for an excellent buffet supper organised by my wife and all too soon it was time to continue. Lefevre-Wely’s Sortie in E Flat (a request from my Mother) started Hours 11 & 12.which also had music by Faure (Pavane), Boellmann (Suite Gothique), Ravel (Pavane) and Guilmant (Grand Choeur in D). A feature of the hours from midnight until 6am was my use of the piano. There were a variety of pieces ranging from Debussy (Clair de Lune) and Faure (the 4th nocturne which I haven’t performed since student days a quarter of a century ago) to Michel Legrand and The Beatles. The hours from 12am until 2am featured some gentle organ music such as Faure (Apres un Reve), Rachmaninov (Vocalise) and Pachelbel (Canon). 2am was entitled Anniversary Hour with music by Vaughan Williams (d1958), Messiaen (b1908), Puccini (b1858) and McDowell (d1908). German and Austrian music featured in Hour 16 (Mozart, Schubert, Mendelssohn amongst others). 4am featured music from the liturgical year, from advent through until passiontide. Music from Italy was played in Hour 18 (including Albinoni, Verdi and Vivaldi). 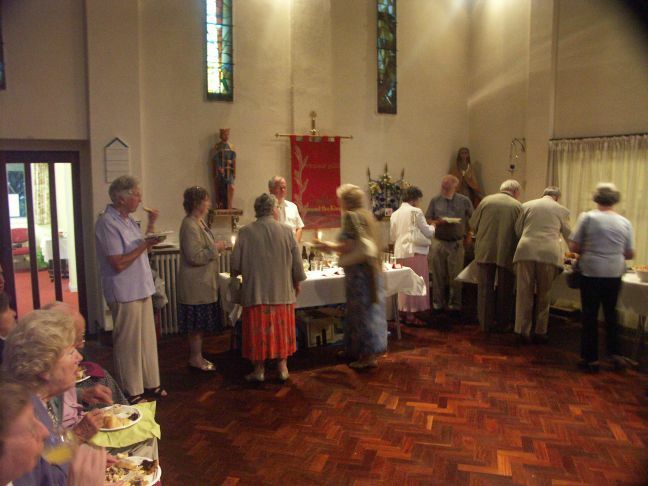 Throughout the night there were always at least three other people in church and I was always appreciative of a cup of tea or coffee during my brief breaks. Indeed there was a great deal of support behind the scenes and many people have devoted a great deal of time to the project. Special mention must also be made of the person who sat in the audience for more than twenty hours. 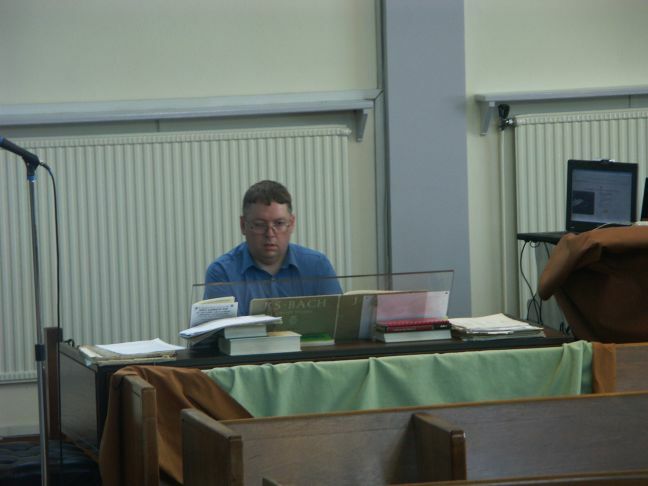 6am saw my second slot devoted to Bach – this time the non preludes and fugues. This was largely made up of chorale preludes and trio sonata movements. Hour 23 was a bit of a hotchpotch. Entitled “A Musical Miscellany”, I featured pieces I hadn’t been able to include earlier as well as works which did not fit into any other category (such as Mushel’s Toccata). By now, the audience had grown to around twenty as I commenced my final piece, a repeat performance of Widor’s Fifth Symphony (note to self: probably not a good idea to put the most taxing piece in Hour 24). As the final chord of the toccata died away, the audience rose and applauded – my first (and probably last) standing ovation. The high point was definitely that ending and the huge sense of relief as well as the realisation of what I’d actually done. The low point came not as I’d expected in the depths of 3 and 4am but around breakfast time. By the time I got to the end my hands and feet were not always going where my brain was telling them to! Would I do it again – probably. We’ll see how much money is raised from this one. I would personally be disappointed with a sum less than £2,500. The organ itself held up pretty well to the ordeal although the reeds have been shot to pieces! The vast majority of the twenty-four hours were recorded and audio will be available here at some point, as will photographs. PIANO - Legrand - "I Will Wait", "Windmills of your Mind" & "The Summer Knows"